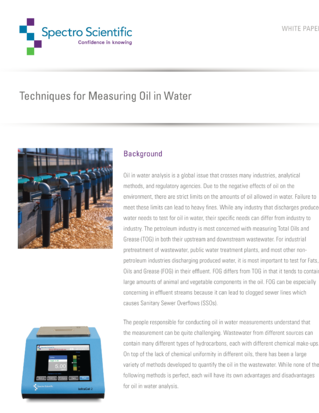 The people responsible for conducting oil in water measurements understand that the measurement can be quite challenging. Wastewater from different sources can contain many different types of hydrocarbons, each with different chemical make-ups. On top of the lack of chemical uniformity in different oils, there has been a large variety of methods developed to quantify the oil in the wastewater. While none of the following methods is perfect, each will have its own advantages and disadvantages for oil in water analysis.Oil in water analysis is a global issue that crosses many industries, analytical methods, and regulatory agencies. Due to the negative effects of oil on the environment, there are strict limits on the amounts of oil allowed in water. Failure to meet these limits can lead to heavy fines. While any industry that discharges produced water needs to test for oil in water, their specific needs can differ from industry to industry. The petroleum industry is most concerned with measuring Total Oils and Grease (TOG) in both their upstream and downstream wastewater. For industrial pretreatment of wastewater, public water treatment plants, and most other nonpetroleum industries discharging produced water, it is most important to test for Fats, Oils and Grease (FOG) in their effluent. FOG differs from TOG in that it tends to contain large amounts of animal and vegetable components in the oil. FOG can be especially concerning in effluent streams because it can lead to clogged sewer lines which causes Sanitary Sewer Overflows (SSOs). There are several methods available for both laboratory and field analysis of oil in water. The choice of methods depends on budget, location of testing, time, and other factors. The most important thing is to consistently test for the amount of oil in water in your wastewater stream in order to avoid any regulatory fines and prevent potential damage to environment.